Pepper, known as the King of spices, features prominently as the main character in tales of the spice trade. Botanically named Piper nigrum this warmth inducing berry began its journey across the world from India some four thousand years ago. 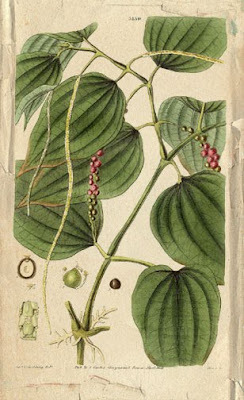 A tropical vine, native to of the southern region of India, Piper nigrum produces a berry termed as black, white and green peppercorns. The different colors are derived from the freshness and processing of the fruit, all from the same plant. Both these peppers are under the planetary influence of the red planet, Mars. The palette of the botanical and natural perfume artist contains Piper nigrum essential oil distilled from the dried berries originating in India, Indonesia and Madgascar. There is also a C02 extract from India with similar characteristics. Black pepper is a top to middle note with a strong personality and thus must be used mindfully so that the blend is not overtaken by the warm, pungent aromatic. Schinus molle, pink peppercorn, essential oil from Peru has a similar aroma as the black but with "greener" aspect. For aromatherapy synergies I have used black pepper essential oil in blends for arthritis combined with Vetiver and Juniper. Since it is a "warming" essential oil I like to use it during the cold months in the bath or for massage to stimulate circulation. For aromatherapy preparations that are more emotionally based I have combined Black pepper with Thyme, Elemi and Grapefruit to strengthen the will force. Whether used for natural perfume or aromatherapy this essence requires mindfullness, like the pepper we use to flavor our food, just a small amount is all that is necessary. Consider pepper an accent note to your blend or perfume. When I was working on the botanical perfume called Aurora it began as a recreation of carnation using the four ingredients listed above. 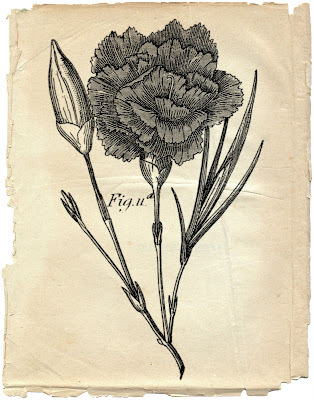 The book "Flower Oils and Floral Compounds in Perfumery" by Danute Pajaijis Anonis contains several formulas for the creation of Carnation, albeit using synthetic aroma chemicals. It is possible however substitute many of the synthetic chems with accords and notes from botanical essences. Piper nigrum botanical drawing from 1832 has been digitally altered from the original found at Wikipedia.